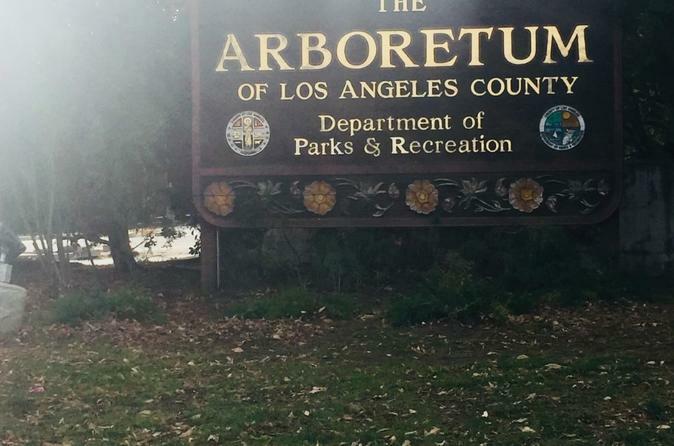 This private sightseeing tour shows you the Arboretum of Los Angeles & Botanical Garden, best of Los Angeles don't miss out the Queen Anne Cottage, watch the peacocks around you. There are 251 Different species sighted at the Arboretum. You can take a1 hr stop. Drive by the Angels, Stopping at the walk of Fame, Celebrity Homes in Beverly Hills designer shops on Rodeo Drive the iconic Sunset Strip, the Hollywood Sign high above the city within Griffith Park. Your round trip hotel transport, Snacks water and $5.00 Subway Gift Card are covered. Your bus picks you up about 9 am depending on traffic situations from your hotel in Los Angeles within 5 miles radius from the Airport and takes you to the Arboretum of Los Angeles County & Botanic Garden, where you can cultivate natural Agriculture and historic resources for your learning, enjoyment and inspiration. Explore the paths, discover the unique plants and wildlife, and have fun on your journey throughout the 127 acres. Stop at the Peacock Cafe for a drink and a delicious meal, then purchase the latest book or tool in the Garden and Gift shop so your gardening fun will continue at home. Discover new ideas in the Arboretum Library and stop in for plant information and story time. Enjoy the special events,and educational programs offered for the entire family kids enjoy watching Peacocks around them at certain areas in the park. After your stop at the Arboretum now your bus driver will head towards seeing the city's highlights with your group where you can enjoy the city of Los Angeles. Look for your favorite celebrity's star on the Hollywood Walk of Fame. See Madame Tussad's Wax Museum, Hard Rock Cafe, Dolby Theater the new home of Oscars and many other fun attractions along world famous Hollywood Boulevard. Stop for 30 min Enjoy complimentary Snacks, Water bottle and $5.00 Subway Gift Card. Go inside Griffith Park, stop for 45 min one of the largest urban parks in North America, looming high above Los Angeles. Stop to take pictures in front of the Hollywood sign with incredible city views. Drive by Beverly Hills, Bel Air, and celebrity mansions. Ride over to upscale Rodeo Drive and stop for 30 min wherever you like to browse or shop.